The story of SamyLabs is the story of three entrepreneurs who thanks to their knowledge in design, assembly, mechanics, automation, electronics and programming have been able to develop from scratch and with reusable components all types of mechanical devices: from laser markers, to a robot, or a 3D printer for plastic materials. The maker culture and the DIY philosophy are deeply rooted in Amador García Usábel, Jose Felix Torre Santos and Jon Martinez García, who are very close to see their last big dream fulfilled. Two years ago they considered the possibility of manufacturing their own 3D printing machine in metal with SLM technology. After two prototypes, a semifunctional machine and the support of an Ekintzaile program of the SPRI Group and the Basque Government, Area 1 grant from the Diputación de Bizkaia, its participation in the OpenMaker program of the European Union and collaboration with ONA Electroerosión, already have a commercial machine: the Alba 500. Jon Martínez takes the floor on behalf of the three partners of SamyLabs. What are the advantages of SLM technology in metal? The SLM (Selective Laser Melting or Selective Laser Fusion) technology allows the creation of complex pieces of small size by the addition of metal powder fused with laser. The great advantage is that it allows to make pieces that can not be created with any other type of machining process, such as hollow pieces, elements with internal structure that give lightness and resistance and even internal conduits. In addition, it produces final and functional piece. Another advantage is that it can be printed on a wide variety of materials such as aluminum, steel, titanium or cobalt. What are the sectors most interested in this type of technology? It is breaking into sectors such as the medical-dental and the prosthetic. A printer of this type is capable of producing 50 dental implants in a few hours with the saving of time that this entails. In the industrial sector is being used to make molds in a few hours, or to create spare parts that are no longer in stock. It also has important profits in sectors such as automotive or aeronautics. It is a technology that few companies develop. In fact, in Europe there are less than a dozen firms that sell SLM 3D printers and in the State we are the only ones. How is the SamyLabs project? Right now we have a commercial prototype, the Alba 500, which we have developed in collaboration with ONA Electroerosión. They have helped us to manufacture the machine and we provide the electronics, the laser, the control and the slicing 'software'. On the other hand, we have looked for several tractors customers to which we offer the machine at cost price in exchange for being able to test, debug the technology and certify it. It is important before going on the market try to improve everything possible and these customers help us. Right now we are in that process and we are also working on European certifications. Our idea is to put it on the market next year. What distinguishes your 3D printer from other existing ones in the market? We want to launch a printer with similar features to those offered by the Asian market and with Asian market prices. The main problem when you acquire a product in Asia is the assistance and not having access to the necessary know-how in case there is a problem. We are going to manufacture from Europe and we can provide this much needed assistance to customers. Another advantage of our Alba over the competition is that we have our own 'software' of lamination that we have developed over the years and that allows the customer to touch up different parameters of the printing process, something that other brands do not facilitate. The customer can modify parameters such as the thickness of the layer, the time of contribution of the layer, the power, the speed of the laser, the modes, the passes, 'offset'. Thanks to our 'software' it is possible to control the printing time and the quality. How responsive has the SamyLabs project been in the market? Very big. This is happening very fast. Two years ago, at the 2016 BIEMH fair, the idea came up. A year later we were presenting the Alba 250 at the same fair. We were approached by interested people: from private investors, companies and investment funds, but decided to continue on our own so as not to be subject to the obligations of a partner. We have invested money from our own pockets but nothing would have been possible if we would not had the support of the Ekintzaile program of the SPRI Group and the Basque Government, the Subsidy Area 1 of the Diputación de Bizkaia, the participation of Tecnalia in the OpenMaker program of the European Union or the collaboration of ONA Electroerosión. In the last edition of BIEMH we presented the Alba 500 and we have confirmed that the interest is still there. 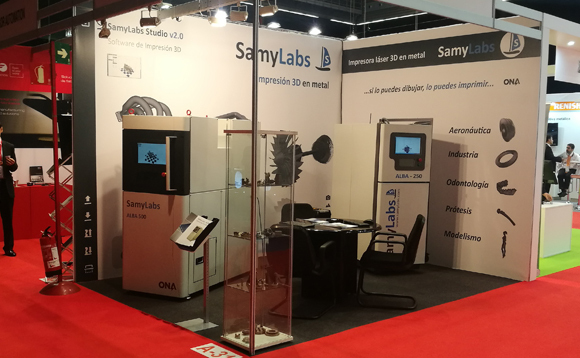 If all goes well, next year we will be able to present with price the first SLM 3D printing machine in metal manufactured in Spain.